Humor with an Attitude: Mani Ratnam ki Aag………… oops RAAVAN. Well, A wonderful camera along with some world class frame captures, Thanks to Santosh Sivan. He held the camera with very subtle and slow movements during the jungle he dreamt. The same camera went eerie during the fight scenes and dances, proving that directorial ventures are not the same for Sivan. You can compare the body capture of Aishwarya and the jungle during cinematography was similar to Kareena in Asoka. When the camera and elements are both in motion for prolong time, you not only feel headache but a burning question why? Why? Ravan proposed to Sita and accepted his guilt rotating. And above all why Santosh was rotating? Dark Gloomy filled with Multani mitti and turmeric faces was shot perfectly, but I hope they should be shot still to make them as Art. The story lacks the gripping power of Ramayana, and you can go buy yourself cheese popcorn without adding any further doubts. Valmiki must be cursing Acharya and Mani for this poor adaptation of Ramayana mixed with Maoist. Please expect The mighty Ravana (a great scholar and a capable ruler) as a Hideous Maoist. The Movie opened with a scene from Dantewada massacre and a brilliant casting. Soon the slow motion and weak story prevailed the first half and destroyed it completely. Weak story was never expected from a director of Mani’s Calibre. Well, Well Well…. Every masterpiece comes with a patch and surely this is the weakest Daub of Mani Ratnam’s career. Ravan’s motives were well justified in a truly gripping scene were Priyamani played a very suitable role. Ravi kisen played the role of Kumbhkaran in a very rustic way. The dialogues were very north but he was holding South style banana leaves for his gastronomic delights. Needless to say that Govinda did justice to Hanuman, but he was not given good dialogues. Overall the Dialogues were too dramatic and filmi. Now coming to Junior AB, well he is still a junior and ruined most of the passionate frames with madness. There is always a fine line between Madness and passion. Aishwarya delivered the “Bak..bak.. “Dialogues better than him in the end of the movie. However she carried her Eyeliner throughout the jungle, Mani overlooked the makeup artist’s overdo. Her bruises were very flimsy and never gave an impact (not even with her expression). She was shot brilliantly and her eyes are having gossamer touch. When you go wrong, you go wrong… Action and choreography was ruined to extremes. The jump scenes were repeated many times. Shyam Kaushal and Peter Hein made use of too many ropes. However last fight scene was shot aesthetically. Even AR Rahman could not do justice to nicely penned lyrics. The last song was heavy with lyrical delights but was overshadowed by light outs. No comments on overhyped south star Vikram. It’s not his fault; he was trying harder when sharing screen space with Aishwarya. The plot mixes the ethical conflicts equally but failed to deliver into a well said story. When you take a plot from Good vs. Evil and you cannot describe the King from the Demon, you land up watching a King-size disappointment. 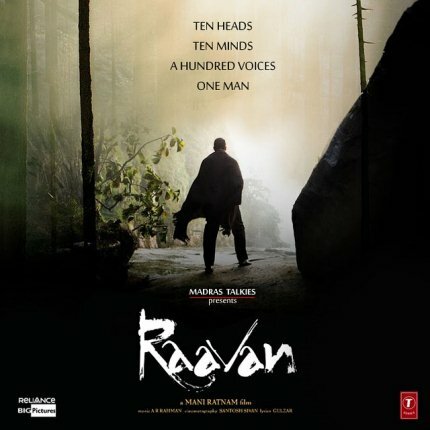 Altogether, RGV ki Aag was better than Mani Ratnam Ka Raavan. 1/5 Star is for Santosh Sivan cinematography.